Trailblazers takes one pretty old idea (the futuristic racer) and one relatively new idea (covering your environment in as much colour as possible) and brings them together in a riot of light and speed. There's a pretty good chance you never thought 'I wonder what would happen if you took Splatoon and mashed it up with F-Zero', but that's why Supergonk are making racing games and you aren't. In the case of Trailblazers painting your environment isn't about claiming territory, it's about going fast. As you careen around a futuristic track at breakneck speeds you lay down trails of colour that your teammates can use or you can make the most of in your next lap. On the flipside, you want to use your own colours to take out those of your rivals so you can keep an edge. 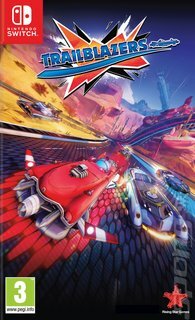 At it's heart Trailblazers is a team game (fear not though - you can play with your pals or with the AI) and you'll find yourself racing like a cycling team, taking turns to speed along behind each other until it's your turn to lay it all down. There are plenty of different cars to choose from, each offering their own set of stats that will work better on some tracks than others, and a cast of different drivers each with their own style and place in the world of Trailblazers. The fact that they're drawn by BAFTA award-winning artist Will Milton helps, too! If you're looking to thrash around a track and take in a visual feast, you won't go far wrong with Trailblazers.